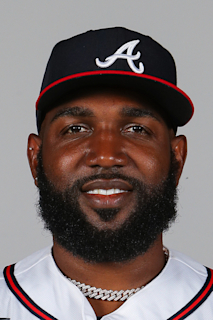 His cousin, Pablo Ozuna, was originally signed by the St. Louis Cardinals, was part of the trade which acquired Edgar Renteria and played seven seasons in Major League Baseball with the Marlins, Rockies, White Sox, and Dodgers...Nicknamed "The Big Bear"...Is married to Genesis and the couple has three children, Yolgiessy, Dalnny and Genssy...Resides in Santo Domingo, Dominican Republic. Played in 148 games for the Cardinals in his first season with the club, starting 146 in left field...Led all Major League left fielders with 1,283.1 innings played at the position...Named National League Player of the Week (June 11-17), his third career selection for the league award...Led the Cardinals in RBI (88), multi-hit games (46), multiRBI games (22) and tied for the team lead in hits (163) and triples (2)...Recorded an RBI in a team-high seven straight games (6/916), T-3rd longest in MLB with teammate Matt Carpenter...Tied for the National League lead with 31 go-ahead RBI (Rizzo, CHI) and ranked 5th in game-winning RBI (13)...Collected 122 singles, ranking 6th in the NL and T-10th among Cardinals since 2000...Had two multi-home run games (6th & 7th career), both during the same week (at WSH 9/4 & at DET 9/7)...Tied Matt Carpenter hitting 13 home runs at Busch Stadium in 2018, T-9th most by a Cardinal in a single season...Ranked among September leaders in home runs (7, T-7th) and RBI (19, T-8th)...Rapped out a season-high 4 hits at WSH (9/5), sandwiched between 2 multi-HR games (9/4 & 9/7)...Ranks 2nd in the NL in RBI (212) and 5th in hits (354) over the past two seasons...Missed eight games on the disabled list due to right shoulder inflammation (8/22-31)...Hit safely in 16-of-20 games in the month of August...Tallied 64 hits with 2 outs, ranking T-3rd in the National League...Hit his first career walk-off HR vs. COL (7/30) off Jake McGee; was his 5th career walk-off RBI and 2nd extra inning home run...Homered in 3 straight games twice (6/13-16 & 7/28-30), one shy of his career-high...Hit his 5th career grand slam and 2nd of the season vs. CHI (7/28)...Hit safely in 22-of-27 June games (34-102, .333) with an RBI in 14...Among N.L. June leaders, ranked 7th in batting (.333), T-7th in RBI (21), T-3rd in hits (34), 8th in total bases (59) and T-2nd in go-ahead RBI (7)...Hit 4th career grand slam vs. PIT (6/3) off Nick Kingham, becoming only the 7th Cardinal fourth place hitter to hit a slam in game's opening inning (Last: Albert Pujols on 8/10/2002 vs. NYM)...Hit 100th career HR vs. PIT (6/2) off Chad Kuhl, also marking his 1st home run as Cardinal at Busch Stadium III...Had six outfield assists ranking T-5th among left fielders and T-16th among National League outfielders...Posted a 12-game hitting streak (4/1-13). Earned the Rawlings National League Gold Glove Award from left field ... Earned his first career Silver Slugger Award ... Finished 15th in the National League All-Star Voting ... Led National League left fielders in put outs (305), fielding percentage (.984) and ranked 2nd in outfield assists (10) ... Has 41 career outfield assists since 2013, ranking T5th in the N.L. His 1,469 total chances rank 3rd and .988 fielding percentage rank 3rd ... Led all National League No. 4 position hitters with a .548 slugging percentage and .924 on-base + slugging percentage ... Earned second career All-Star Game selection and started in left field as voted by fans. Posted a .316 average (107- 339) with 16 doubles, 23 home runs and 70 RBI in first half to earn the nod. Went 0-for-2 in the game in his home stadium batting 8th in the lineup ... His 70 RBI prior to the All-Star break were tied for the MLB-lead ... On the year, set new career highs in games (159), runs (93), hits (191), doubles (30), home runs (37), RBI (124), walks (64) and average (.312) ... His 124 RBI ranked 3rd in MLB and he ranked 4th in National League in hits (191) and tied for third in home runs (37) ... His 124 RBI joined up with teammate Giancarlo Stanton (132) to form the first pair of National League teammates to finish in the Top 3 in RBI in the same season since George Foster (121) and Joe Morgan (111) with the 1976 Cincinnati Reds ... Homered in the same game as Giancarlo Stanton 12 times, the most by any two teammates in MLB in 2017 and set the Marlins record surpassing the 11 by Miguel Cabrera and Alex Gonzalez in 2004 ... Owned a .344 average (98-285) at home, which ranked 4th in the National League, and his 22 home runs at home were 3rd-most in NL ... Ranked among MLB outfielders: 2nd in RBI (122); 3rd in hits (189); T4th in home runs (37); 5th in average (.315); 7th in on-base percentage (.380); 8th in slugging (.555); 9th in on-base + slugging (.935) ... His career-high 60 multi-hit games ranked second in MLB (prev., 39 in 2016), and were tied with Juan Pierre (60 in 2003) for 4th-most in a single season in Marlins history ... His 124 RBI were second most by a Marlins player in a single season, behind Stanton (132) ... Homered in each game of doubleheader at PHI (8/22) becoming the first player in Marlins history to do so since Giancarlo Stanton (9/6/10 at PHI) ... Recorded four multi-home run games (4/11 vs. ATL, 5/8 vs. STL, 7/2 at MIL & 9/22 at ARI); had just one multi-home run game prior to 2017 ... Finished July with 27 RBI, good for 2nd in National League (3rd in MLB); marked new career high for any month and a new Miami team record for July ... Had a streak of seven straight home games with a multi-hit game snapped vs. WSH (6/21). It tied Dee Gordon (4/26- 5/15/2015) for longest multi-hit games streak at home in Marlins history ... Posted 4th career walk-off RBI (third walk-off hit), a single off Enny Romero to score Dee Gordon in an 8-7 Marlins win vs. WSH (6/19) ... Went 2-for-2 with two homers and six RBIs in the Marlins' 8-4 win vs. ATL (4/11). There have been over 2,000 instances of a player producing at least six RBI in a game since RBI became an official statistic in 1920, but Ozuna was only the ninth player to knock in at least six runs with two-or-fewer official at-bats in a game, and the first to do that in nearly 17 years, since the Padres Bret Boone went 2-for-2 with six RBI against the Astros (6/10/2000). Batted .307 with 12 doubles, five triples, 17 home runs, and 47 RBI in the first half to earn first career All-Star Game selection...Chosen as reserve, but started in center field due to injuries (1x2, RBI, so)...Reached base in 36 straight games from April 21-May 29, fourth-longest streak in MLB for the season; tied Hanley Ramirez for fifth-longest on-base streak in Club history...Hit .399 (55x138) with eight doubles, four triples, nine home runs, and 23 RBI during streak...Final 28 games of on-base streak including hitting streaks of 16 and 11 games...The 16-game streak (tied for career-long) ran from April 30- May 16, and 11-game streak from May 18-29...According to STATS LLC, was just fifth player in Club history with back-to-back 10-game hitting streaks (one game played between end of first and start of second)...Others were Cliff Floyd in 2001 (10, 18), Juan Pierre in 2003...(11, 14), Alex Gonzalez in 2005 (17, 11), and Hanley Ramirez in 2010-11 (14, 10)...In May, led National League in slugging (.705), was second in average (.411), behind Daniel Murphy (.416), and was fifth in on-base percentage (.450)...Recorded 400th career hit on May 25 at Tampa Bay, in 391st career game...According to STATS LLC, among players who began career with Marlins, was sixth-fastest to 400, behind Edgar Renteria (340 games), Miguel Cabrera (349), Christian Yelich (350), Luis Castillo (367), and Dan Uggla (380). (Hanley Ramirez had his first 400 career hits with Marlins, in 317 career games, but his first two career games were with Boston at end of 2005, going 0x2)...Had first career multi-homer game on June 20 vs. Colorado (two solo)...Hit 23rd home run September 14 at Atlanta, matching career high (2014)...Hit sixth triple of season on Sept. 19 vs. Washington, setting new career high. Split season between Marlins (123 games) and Triple-A New Orleans (33 games)... Opened season with Miami and was batting season-high .321 through May 2 (22 games), with just seven extra-base hits (all doubles) and five RBI...First home run of season came on May 7 at San Francisco; was first of three homers on a 10-game road trip to West Coast...After May 3, batted .223 (48x215) over next 56 games, including 0x14 in July, and was optioned to NOLA on July 5...Had a hit in 23 of 33 games with NOLA, including .379 (11x29) stretch over first seven games with Zephyrs... Average dipped to .296 before going 6x12 over final four games in NOLA and being recalled on August 15...Hit .237 in 16 games with Marlins in August, but rebounded to hit .299 in September (24 games) and .313 in October (four games)...Hit .278 (45x162) in 44 games after recall, with 20 runs, 13 doubles, six home runs, and 18 RBI...Hit .360 (18x50) over final 13 games, with seven multi-hit games...Posted .341 (29x85) average vs. left-handers, with seven doubles, two home runs, and eight RBI... His .996 fielding percentage ranked sixth among NL outfielders. Season ended early due to injury for second straight year when he suffered high right ankle sprain on September 21 vs. Washington...At time of injury, led Majors in HR (15) and RBI (40) in 7th inning or later; ?nished sea-son tied with Lucas Duda for lead in home runs, and was still leader in RBI...HR total in 7th inning or later tied Derrek Lee (2000) for most in Club history...Was tied for 12th in National League in home runs (23), and was 10th in RBI (85) when injured; ?nished season tied for 14th in HR and tied for 11th in RBI...Among NL out?elders, was tied for ?fth in HR (22) and was fourth in RBI (84) when injured; finished season tied for seventh in HR and ?fth in RBI...Homered in four straight games from Sept. 8-11; tied six others for Club record...Had only career pinch-hit home run, a solo shot, on June 29 vs. Oakland...Was second among NL center ?elders in RBI (82), behind Andrew McCutchen (83), and trailed only McCutchen (25) and Carlos Gomez (23) in home runs (21)...Hit first career grand slam and set career high with ?ve RBI on May 21 vs. Philadelphia...Hit second career grand slam on August 22 at Colorado, and matched career high with ?ve RBI...Had first career walk-off hit (second career walk-off RBI) on Aug. 14 vs. Arizona...Other walk-off RBI was ninth-inning sac ?y vs. Mets on May 7, in a 1-0 win...All six of his AB on May 3 vs. the Dodgers were with RISP; just second player in Club history to have six AB with RISP in a game (Alfredo Amezaga, 9/2/08 vs. ATL)...On June 20 vs. Mets, had ?rst career game with two OF assists, both at home plate...Threw out David Wright for second out of eighth inning, preserving 3-2 lead. Second assist ended game with same score, throwing out Kirk Nieuwenhuis attempting to score from third on Chris Young fly out...According to Elias, just third Marlin OF to have two assists at plate in a game (Joe Orsulak, Emilio Bonifacio), and only second (with Orsulak) to do so without a relay on both throws. Also, ?rst Marlin OF ever to throw out runner at home to end regular-season game...Additionally, was just third MLB out?elder in last ?ve seasons to earn two assists on OF-to-C putouts in same game, joining Shin-Soo Choo and Yoenis Cespedes, and ?rst since David DeJesus in 1999 to cut down tying or go-ahead run twice in eighth inning or later...On July 8 at Arizona, hit two-run HR on 2-2 pitch with two outs in top of ninth to give Miami eventual 2-1 win...According to Elias, was ?rst Marlin since Mike Lowell on June 28, 2003 at Fenway Park to drive in game-tying and game-winning runs with two outs and two strikes in the ninth inning. In addition, became ?rst Marlin ever to hit a home run to give team a lead after being one out away from a shutout loss...Had 15-game hitting streak from June 24 to July 9, batting .368 (21x57) with ?ve doubles, three home runs and eight RBI...Fell one game short of career-long streak, established from May 15-31, 2013. Season debut was delayed until April 16 by broken fourth metacarpal in left hand... Suffered injury crashing into fence in a Minor League Spring Training game... Was recalled from four-game rehab stint at Single-A Jupiter on April 20 and assigned to Double-A Jacksonville. Appeared in 10 games for Suns, belting five home runs over final six contests, before being recalled to Miami on April 30... Made Major League debut that night vs. New York Mets (1x3). Recorded first career hit off of Jeremy Hefner in second at-bat... Had a hit in first six games, tying Scott Pose (1993) for second-longest hitting streak to open a career in Club history, behind Alejandro De Aza (8 in 2007). - STATS LLC.. Set Club record for most hits in first six career games (11). - STATS LLC... Had four-hit game on May 5 at Philadelphia, his sixth career game, at the time becoming second-fastest player in Club history to achieve that feat. Ed Lucas later set Club record, on June 2 vs. the Mets, in his third career game, moving ahead of Ozuna and Hanley Ramirez (four games). - STATS LLC... Had a 16-game hitting streak from May 15-31, marking second-longest hitting streak by rookie in Club history, behind Edgar Renteria (22 in 1996). - STATS LLC... Batted .356 (21x59) during streak... Was second-longest streak of season by a rookie (Jose Iglesias, 18), and tied with several others for sixth-longest streak for any player... Had eight game-winning RBI, tied for third among rookies, behind Evan Gattis (11) and Nolan Arenado (9). Tied Alex Gonzalez (1999) for fourth-most by rookie in Club history, behind Mike Jacobs (11 in 2006), Miguel Cabrera (10 in 2003) and Kevin Millar (9 in 1999)... Reached season-high average of .336 (42x125) on June 4, through 33 games... Had eight OF assists, sixth-most by rookie in Club history, behind Mark Kotsay (20 in 1998), Jeff Conine (11 in 1993), Giancarlo Stanton (10 in 2010), Preston Wilson (10 in 1999), and Todd Dunwoody (9 in 1998)... Suffered torn left thumb ligament on July 22 at Colorado and missed remainder of season following surgery... Named Southern League Hitter of the Week for April 22-28, the week prior to his call-up. Went 11x30 (.367), with a double, a triple, five home runs and 11 RBI. Was Florida State League All-Star for Single-A Jupiter, and earned Marlins' Minor League Player of the Month honors for August...Batted .365 (38-for-104) over that stretch, with 24 runs scored, eight doubles, eight home runs, 32 RBIs and a .421 on-base percentage...Finished first in FSL in runs, home runs, RBIs and total bases (233), fourth in slugging, seventh in hits, tied for ninth in doubles and 10th in OPS (.805)...Won Rawlings © Minor League Gold Glove Award for right field...Posted .988 fielding percentage in right field (three errors in 257 total chances), while recording nine of his 10 outfield assists at the position...Also played 14 games in center field (one assist)and one game in left field...Batted .500 (10-for-20) with bases loaded, with a walk, sac fly, five doubles, two home runs and 28 RBIs...Batted .299 (43-for-144) with RISP, with 11 walks, 11 doubles, 10 home runs and 74 RBIs...Recorded 35 multihit games, including 12 three-hit games...On June 10-11 at Bradenton, went 6-for-9 with five home runs and 12 RBIs over two-game stretch...Was 3-for-4 with three home runs and six RBIs on June 10, and 3-for-5 with two home runs and six RBIs on June 11...Had season-high seven-game hitting streak from July 31-August 7...Batted .346 (9-for-26) during streak, with six runs scored, two home runs and five RBIs. In 2011 for Single-A Greensboro, was second in South Atlantic League in runs, third in total bases (239) and fourth in home runs...Had 10-game hitting streak from April 16-27, batting .436 (17-for-39) with seven home runs and 13 RBIs...Surpassed that with 11-game streak from Aug. 15-26; batted .319 (15-for-47), with four home runs and five RBIs...Batted .218 (52-for-238) in first half, with eight home runs, 33 RBIs and a .285 on-base percentage...Rebounded in second half, batting .310 (80-for-258) with 15 home runs, 38 RBIs and a .371 on-base percentage. Began 2010 season with Grasshoppers, playing in six games from April 8-13 before missing more than two months with a left forearm fracture...Returned June 18 for Short Season A Jamestown...Opened stint with eight-game hitting streak, batting .353 (12-for-34) with two home runs and five RBIs...Homered in three straight games twice: from July 10-12 (three homer, six RBIs) and Aug. 12-14 (three homers, 10 RBIs)...Closed out campaign on seven-game hitting streak, batting .323 (10-for-31) with two home runs and eight RBIs. Spent 2009 with Gulf Coast League Marlins...After batting .185 (5-for-27) in six games in June, hit .396 (38-for-96) in 24 games in July before finishing campaign with .264 average (24-for-91) in 25 games in August...Had 17 multihit games, including one four-hit game and five three-hit games...Had just four multihit games after July 22. September 1, 2018 St. Louis Cardinals activated LF Marcell Ozuna from the 10-day injured list. August 22, 2018 St. Louis Cardinals placed LF Marcell Ozuna on the 10-day disabled list. Right shoulder inflammation. December 9, 2015 OF Marcell Ozuna assigned to Gigantes del Cibao. August 15, 2015 Miami Marlins recalled LF Marcell Ozuna from New Orleans Zephyrs. July 6, 2015 Miami Marlins optioned CF Marcell Ozuna to New Orleans Zephyrs. October 31, 2013 Marcell Ozuna roster status changed by Miami Marlins. August 19, 2013 Miami Marlins transferred RF Marcell Ozuna from the 15-day disabled list to the 60-day disabled list. July 2013 left thumb surgery. July 25, 2013 Miami Marlins placed RF Marcell Ozuna on the 15-day disabled list retroactive to July 23, 2013. Left thumb ligament tear. July 23, 2013 Miami Marlins optioned Marcell Ozuna to Jacksonville Suns. April 30, 2013 Miami Marlins recalled RF Marcell Ozuna from Jacksonville Suns. April 20, 2013 Marcell Ozuna assigned to Jacksonville Suns from Jupiter Hammerheads. April 16, 2013 Marcell Ozuna assigned to Jupiter Hammerheads from Jacksonville Suns. April 4, 2013 Marcell Ozuna roster status changed by Jacksonville Suns. March 11, 2013 Miami Marlins optioned RF Marcell Ozuna to Jacksonville Suns. November 20, 2012 Miami Marlins selected the contract of Marcell Ozuna from Jupiter Hammerheads. October 13, 2012 OF Marcell Ozuna assigned to Gigantes del Cibao. April 5, 2012 Marcell Ozuna assigned to Jupiter Hammerheads from Greensboro Grasshoppers. March 6, 2012 RF Marcell Ozuna assigned to Miami Marlins. April 7, 2011 Marcell Ozuna assigned to Greensboro Grasshoppers from Jamestown Jammers. June 17, 2010 Marcell Ozuna assigned to Jamestown Jammers from Greensboro Grasshoppers. April 15, 2010 Marcell Ozuna roster status changed by Greensboro Grasshoppers. April 2, 2010 RF Marcell Ozuna assigned to Greensboro Grasshoppers from GCL Marlins. May 26, 2009 Marcell Ozuna assigned to GCL Marlins from DSL Marlins.